Jawahar Kala Kendra (JKK) opened its refurbished print making studios today with three exhibitions on print art. These are namely – ‘The Printed Picture’, ‘Khel’ and ‘Prints from Rajasthan’. 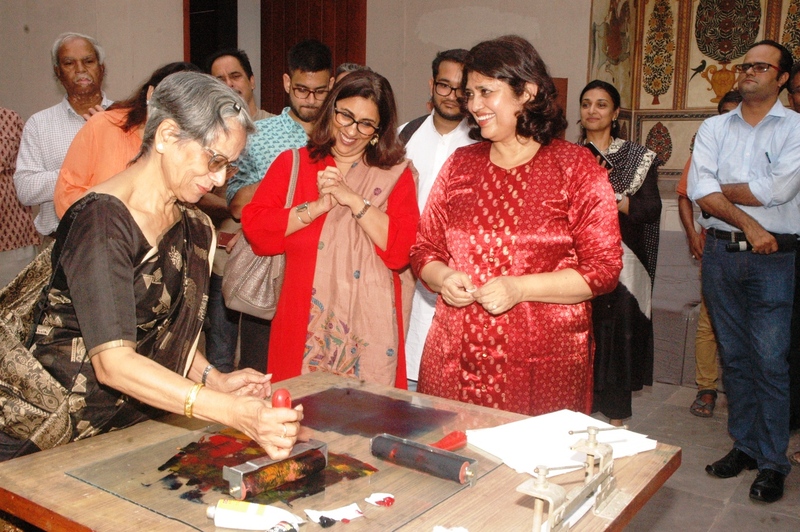 The exhibitions were inaugurated by renowned artist, Ms. Anupam Sud by rubbing prints. The exhibitions extol the history and process of print making within Rajasthan, India and abroad. ‘The Printed Picture’ — Four Centuries of Indian Printmaking is being held in collaboration with DAG Modern. The exhibition charts printmaking’s eventful journey in India from its inception as a tool of the colonial enterprise to its rapid success in the printing industry in the 18th century. The exhibition was held in. It also traces the entry of the Indian bazaar print in the hands of the artisan as well as the art school trained artist. The exhibition is curated by artist and scholar, Dr. Paula Sengupta. The exhibition ‘Prints from Rajasthan’ will showcase the work of key artists from Rajasthan and their contribution to the genre of print making in India over the past 5 decades. The exhibition ‘Khel’ has been organised by Chaap Foundation. It showcases the intelligent yet playful response by artists from 14 different countries to 3 ancient games Ganjifa, Saanp Sidi and Shatranj invented in India and Middle East. Referring to the various paradoxes of life, the games are interpreted by the artists, using different formal approaches to their socio-political realities. The exhibitions also explore a variety of mediums ranging from lithography, etching, woodcuts etc. Exhibited as individual works on paper, they are also bound as books showcasing the vast possibilities of the print medium. Both these exhibitions have been curated by Kavita Shah who is herself a renowned print maker based in Baroda. During the ongoing exhibition there will also be curatorial walks, seminars and workshops. The exhibitions will be on till 8 October (except Mondays) from 11 am to 7 pm at the Museum Galleries of Jawahar Kala Kendra. Tomorrow (6 August) there will be a curatorial walkthrough of the exhibitions at 12 noon.